I got a question this week from a reader looking into some of the nitty-gritty details of test taking prep. I’ve been going back and forth with a friend of mine on eating before tests. He seems to think that eating before the test helps his score. I think he’s nuts. What do you think? Okay… maybe it’s not quite that simple. I find questions like this tend to lead down a bit of an obsessive road. When people start talking about whether or not to eat before a test, they eventually start to wonder the best thing to eat before a test. In reality these are super small factors. If eating before a test actually helps someone’s ability to study noticeably then I suspect it’s just because they’re recovering from some kind of consistent nutritional deficit. If a person is in need of some particular nutrition and the food before the test gives that to them then they’ll feel dramatically better. Think about a salad for the average person that never eats salad. People that eat a salad for the first time in a month get an instant small boost in energy. All those nutritional holes just got filled so they could work at full efficiency. Over time it will go away and most people would never notice. If you eat on any particular schedule then follow that same schedule. When it comes to testing time, you want it to be as similar to every other time as possible. Test time is just another class. By adjusting your eating schedule you’re making the test significantly more notable to your brain. You might even get more stressed out because of that change in schedule. If you normally would eat at the time before a test then you should eat. If you’d normally not eat then don’t eat. The human body is designed to go through stressful times without food or with food. The more you worry about your body failing to do that, the more likely it will fail. Just do what you normally do and try not to get yourself psyched up about the test. Of course, if he always eats before every test then he may have created a ritual that helps him relax. Maybe that works for him now that he’s gotten used to it. Some people eat the same foods for each meal every day. If that’s you then ignore this factor. This section is just for people that pick what they’re eating differently everyday. You might also want to consider trying to fill any nutritional holes you suspect you have. Of course, that comes down to nutritional factors that I only have a tiny bit of experience with. Don’t take nutritional advice from a study blog. For tests though, you might notice some healthy foods tend to perk you up. Take advantage of that. The more you worry about the best thing to eat before a test, the more of a problem it will become. This is ultimately a rather small detail in the much bigger picture. 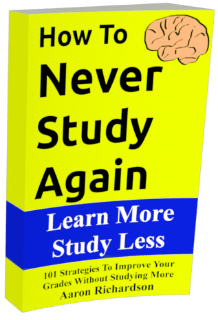 Do you want to know how to study faster, easier, and more efficiently than ever before? (How about in less than 15 minutes a night?) That’s what this blog is all about. Be sure to check out the archives to learn more. Also, be sure to check out the ebooks in the sidebar to learn everything way faster. I always eat before a test. I can’t stand getting hungry during a test. It’s a crazy distraction.